Who doesn’t want a plumper lips these days? And yet, when we see that bee-stung pucker on other women, we can’t help but wonder: Are her lips the result of genetics (à la Angelina Jolie), clever makeup skills, or—gasp!—injections? We blame the stigma around lip injections partly on the current natural makeup trends, and partly on the fact that, in our culture at least, no one really likes to admit when they get work done. But lip injections are happening, and if you’ve ever even for a second been curious about them or how they work, it’s time to stop screen-shotting strangers’ lips on Instagram and get informed. After the patient decides on the size and shape, Dr. Kam tells them about the different treatment options and his recommendations for what will suit them best. In terms of the actual process, he says there are options that contain lidocaine, a common local anesthetic, to make the process as painless as possible. Or, you can ask for a numbing cream 15 minutes before the treatment. The whole process takes less than and hour, and Dr. Kam says most patients can come in with a consultation and leave the same day with a plumper pout. The most popular treatment patients ask for involves Hyaluronic Acid (HA) fillers, which are injected below the outer layer of the skin. “Hyaluronic acid is a substance found naturally in the body and is the main ingredient in FDA approved fillers you may have heard of like Juvederm® and Restylane®,” Dr. Kam explains. 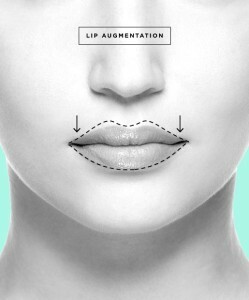 Based on the placement of the filler, your lips can be volumized, reshaped, and redefined. The average cost for lip injections at Onyx Medical Aesthetics falls around $550 to $650 for a 1 cc syringe. However, some people might want a fuller look that requires an additional syringe. If you’re wondering what age is it considered too young to get lip injections, Dr. Kam says most fillers are FDA-approved for cosmetic use among patients 18 years old and up. To learn more about cosmetic medicine treatments that you may be a candidate for, please submit our Contact form or contact us at 519-404-1524. For regular updates on cosmetic innovations and laser tattoo removal, follow us on Facebook and Twitter.